Starting from this month, July 2012, I try to make a monthly report regarding the visitors of this site. I think it will be a great way for me to keep track of my progress. Questions I ask myself include: What do they, the visitors, do on my site; what devices are they using; where are they located, …? I analysed the data from Google Analytics. From 1 July until 31 July, this website received 2,007 unique visitors and had 5,335 pageviews in total, resulting in 2.33 pageviews per visit. Each visitor stayed on my website for 01:57 on average. The bounce rate is 67.09% for this month. The most visited page this month was this blog post about Tomorrowland. The green area shows the mobile users. 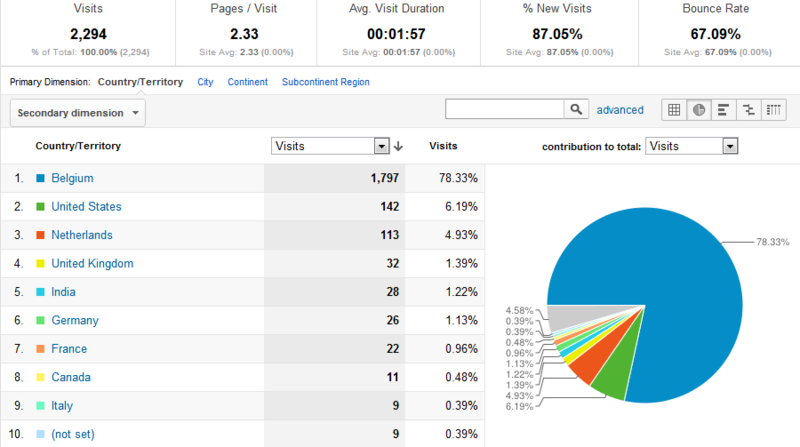 From the 2.294 visitors, 484 used a mobile device to browse this website: more than 20% of all visitors. Nice, but actually quite logical as my site uses a responsive design. The bounce percentage for mobile visitors is the same as for the non-mobile visitors, just under 70%. Which is interesting, is the low number of pages per visit, just 1,5 pages per visit. The average visit duration is also significantly lower than non-mobile visitors, with 49 seconds. I hope both the number of pages per visit and the duration of one visit will increase in the next months. I am quite happy with the bounce percentage and the total number of mobile visitors versus the desktop users. 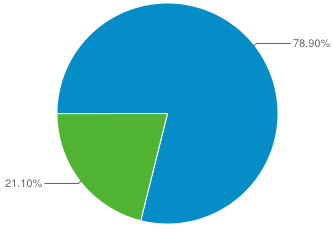 Out of the 484 mobile visitors, 275 visitors used an iPad, followed by iPhone (114) and iPod Touch (28). Other mobile devices are HTC and Samsung phones and tablets. Popular devices are the Galaxy devices, such as: the Galaxy Gio, Galaxy Tab and the Galaxy Nexus. Almost 4 out of 5 visitors (1,797) to this site are located in Belgium, which is easy to explain: this site has the .be extension. More than 75% of all visitors origin from Belgium. 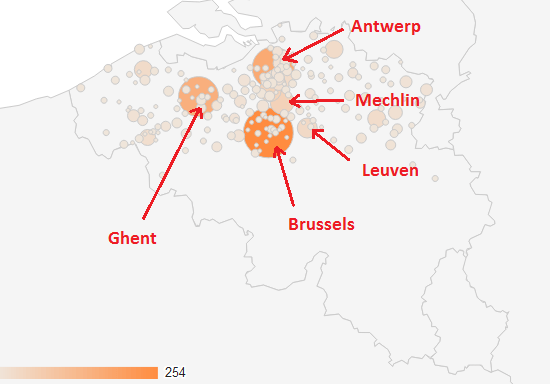 The big cities, such as Brussels and Antwerp, are well-represented. No surprise here, since most people live in these cities. I hope to make this the main source of visitors. And yes, I am on the right track: almost 2,000 visitors (or 86%) of all visitors came via a search engine. It’s no surprise Google is the main source of visitors with 1,860 visitors, which is equal to 95% of all search engine traffic. AOL, Conduit Search and Bing are completing the top 4 with each less than 1%. Direct traffic delivers less than 10% of all visitors, referral traffic 5% and campaigns <1% (campaigns, such as feeds). There are a bunch of websites, such as Alexa, who measure a website’s popularity. I categorize these sites as ‘external’ as they only give an estimate ranking since these sites do not directly track the number of visitors. Alexa Rank: 3,825,439 (up from 8,000,000+ previous month) with 58 sites linking in.